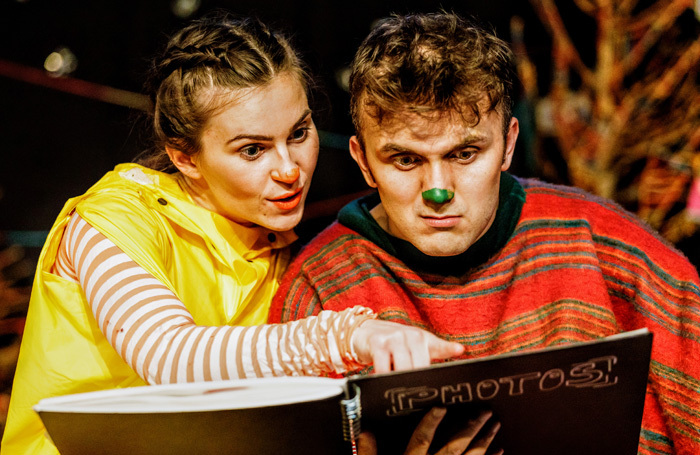 There are a number of festive alternatives to panto for young children this year, and this homespun tale from SharkLegs is a fine example. A grinch-like figure who is in fact a woolly jumper named LongSleeves tries to attach a bauble to a bare Christmas tree. But he’s held back by a bungee cord. He’s soon joined by a flipper-sporting young duck, but can they overcome their miscommunications to decorate the tree? From the start the young audience clamour their suggestions to the hapless pair, but the frustration (and noise) builds as they fail to find a breakthrough. Performers Richard Hay and Christina Forrest deal admirably with the energetic crowd and communicate some key ideas, not least the importance of overcoming challenges through teamwork. It’s a pity that a change in style towards the latter stages confuses the message. The sudden introduction of puppets and dialogue to tell the backstory of LongSleeves feels rather out of kilter. There is also a slight issue of crowd control as the children jockey for position around the pop-up book. But the physical comedy is expertly handled by Hay and Forrest, with barely a dropped bauble. And the breakthrough moment when it arrives is suitably euphoric. A craft workshop beforehand invites children into the world of the show and to feel invested in the onstage decorations, while Caitlin Abbott’s set of long-dead Christmas trees also emphasises a subtler message about the disposable nature of Christmas.